It is a small thing—perhaps seemingly insignificant to someone who might think that a single voice doesn’t matter—the simple telling of a story. Well it does matter. A solitary voice with a compelling story or message, becomes two, becomes four, becomes eight and blossoms, exponentially, into a tapestry of resonant voices, a critical mass—a movement. I’ve seen it happen. A mother of a child might be brought to tears by the challenges of her daughter, her son, and so she shares that story with friends. A father might read about an incidental moment in time that reminded him of his childhood, and so he passes the story on. A woman might linger on words that made her think of her father or mother—or perhaps reflect on being a parent—then goes on to share that story with siblings and friends. A parent, a student, a friend, an acquaintance, might be reminded of the simple joys and pleasures in life that they were taking for granted, and be moved to use their voice to share that message with loved ones. 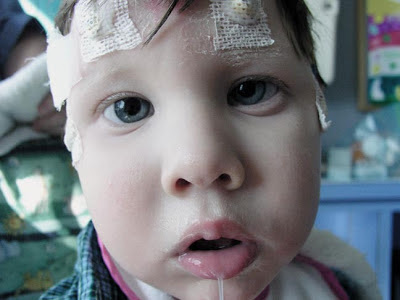 Or perhaps a harrowing story of a little boy suffering countless seizures makes someone realize how bad, prevalent and lethal epilepsy is, having never before been aware, and that person shares the story with everyone they know. Your voice is a single voice, it’s true, but it can become a million strong, three million strong, three hundred million strong, if you simply share a story, pass on a message. In the spirit of epilepsy awareness month, November, I’m asking a small favor. Next time you read a post on Calvin’s Story, if it moves you, makes you reflect or reminisce, laugh or cry, please share it with others. It’s a very worthy cause. Your voice, whether you know it or not, will be helping to find a cure for epilepsy, this devastatingly obscure disorder that afflicts and kills more people than breast cancer. Didn’t know that? There’s one good reason that Calvin and I need your voice. We need to find a cure. He can't do it by himself—needs a leg up—and you can give it to him, and to millions of others and their families. So, take that one, simple step that you might have considered before now, which is to share Calvin's Story. Those who have done so already have sparked a critical mass for epilepsy awareness. Doing so means the world to me, because—like many of you might imagine—so does Calvin.